The spinal cord ends in the lumbar area and continues through the vertebral canal as spinal nerves. 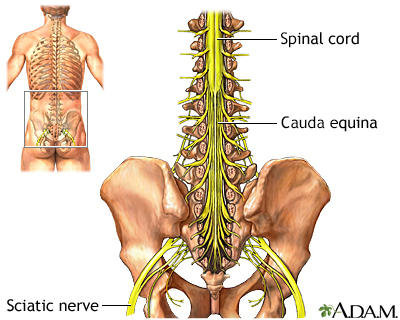 Because of its resemblance to a horse's tail, the collection of these nerves at the end of the spinal cord is called the cauda equina. These nerves send and receive messages to and from the lower limbs and pelvic organs.